Amazon has launched a new pay TV service for UK users, providing access to individual TV channels. 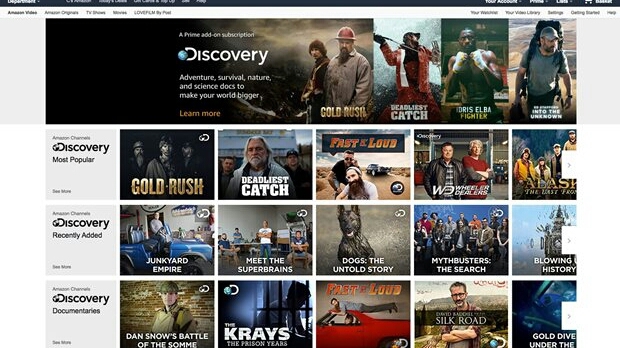 The service, called Amazon Channels, is based on the company's Prime Video service and allows users to access content from broadcasters including Discovery and ITV without lengthy contracts. Amazon Channels is available via the existing Prime Video app to watch on smart TVs, iOs and Android mobile devices, plus through Amazon Fire sticks, sending the programmes to your television. Alex Green, managing director for Europe at Amazon Channels, claimed the service “gives power back to customers to choose exactly what they want to watch”. But the new service doesn't offer the cheapest access to some of the content on offer. For example, users need to have Amazon Prime, which costs £79 a year. Eurosport can be added for £6.99 a month; Discovery £4.99 a month. But viewers can subscribe to TVPlayer Plus and get access to content from both services for £5.99 a month. Services being offered can be accessed elsewhere without the need for Amazon Prime, including children's on-demand service Ketchup TV and the Eurosport Player. Amazon Channels also offers an enhanced version of the ITV Hub, enabling viewers to stream ITV shows ad-free for £3.99 a month. Content from other public service broadcasters and major commercial broadcasters such as Sky, UKTV and BT are absent from the service. Eurosport Player - Live and On Demand sports programming, including Grand Slam tennis, cycling and winter sports for £6.99 a month. Horse & Country Play –Equestrianism and British country lifestyle for £3.99 a month. MUBI – A new, critically acclaimed movie to stream every day for £5.99 a month. Studio Universal Classics – Classic movies from Universal Studios for £3.99 a month.